PhilaPlace - "Address of the Catholic lay citizens of the city and county of Philadelphia"
"Address of the Catholic lay citizens of the city and county of Philadelphia." Cover page, title page and pages 2-3. 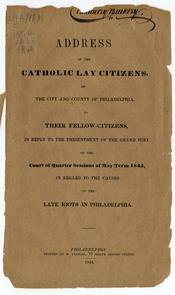 "Address of the Catholic lay citizens, of the city and county of Philadelphia, to their fellow-citizens, in reply to the presentment of the Grand jury of the Court of quarter sessions of May term 1844, in regard to the causes of the late riots in Philadelphia," Philadelphia, Printed by M. Fithian, 1844.